Are Uniformitarian Assumptions Becoming Irrelevant? Holding on to the uniformitarian philosophy causes complications when empirical evidence is discovered! It began with Copernicus who invented a theory which suggests that the Earth is nothing special, what has been going on in the Universe, has been going on for billions of years and will proceed to do the same for more eons to come! A step by step evolutionary process of H2 forming a dust cloud with some of them having convoluted serpentine shapes, which in turn is a nursery for the formation of stars and then as the result of star formation, planets being shaped by gradual, ongoing processes! At least in theory anyway, because star formations and the supposed evolution of planets have been a great mystery to researchers for many years. Secular scientists decided to embrace Copernicus, so much so they began to hate the idea of change because that would mean we are living in a universe that has something special to it! But with new discoveries, some scientists are now abandoning Copernicus and are now saying we living in special times. Scientists are observing young phenomena (which the Bible advocates and has been confirmed by empirical science) that is contrary to old-age assumptions embraced by evolutionists, intelligent design proponents, and old-earth creationists about the universe. 1) Saturn rings are like a car, when you store a car outside with seasonal changes, the car is going to show wear especially after a long period of time! Likewise space is a harsh environment and Saturn’s rings are 90 percent water ice which should appear a lot dirtier as a consequence of being billions of years old. Of course, these scientists did not embrace a young universe rather they increased the complexity in the explanation by invoking the ad hoc solution which was an icy interloper that broke apart and became the rings within the last few million years. This creates another problem, because that is only a small portion of what the assumed age is. So researchers are using Cassini in years to come in order to try and find where all of the billions of years of dirt went to and speculation has the dirt supposedly hiding somewhere in the B ring. If the Cassini cannot find it there and the results point to a low mass for the rings then it will increase the complexity of the old-age assumption which is not a good sign if you believe in the old-age. 2) The geysers of Enceladus represent young phenomena! 16 gigawatts of power which is enormously greater than any internal radioactive heating and the reporter of nature admits that it is very difficult to keep the geysers going for 10 million years let alone for billions of years! Nearby Mimas they say should be producing more heat than Enceladus. So scientists are doing the unthinkable, and that is, they are treating it as a special event! 3) If you think 16 gigawatts of power is difficult to explain in the old-age assumption, try 90,000 gigawatts with its volcanoes! Referring to Saturn’s moon Io. The gigawatts is well above the predictions from models of tidal interactions which is also is well above man’s imagination because planetary scientists cannot not even come up with a scenario to explain it like it often times happens in other areas. 4) Then there is the grand daddy of them all, Saturn’s largest moon, Titan! Atmospheric methane is a known substance to be short-lived rather than something billions of years old. So trying to locate the sources of replenishment has been the focus as well as invoking another explanation! So something special may have happened, one researcher suggested, the sun was the source by being able to warm up to a tipping point for tens or even hundreds of millions of years ago, levitating the frozen nitrogen and methane into an atmosphere that “rained like hell” onto the surface! It will be interesting what else they come up with! And it’s not only Saturn’s rings and its moons but also Mercury, Venus, Earth, the Moon, Mars, Jupiter and its moons, Uranus and its moons and rings, Neptune and its moons and rings, Pluto and comets, asteroids, and dust. Basically the whole system! Do you believe science is about honestly, following the evidence where it leads? Then these same scientists would have to conclude that the solar system is much younger than previously thought! You take away old-age assumptions, it clears up all the confusion! No need to invent a story to fill in the falsifying data.Your following the evidence where it leads which brings about clarity not confusion! Keep this in mind, when evolutionists argue their points in the present time, but in the future spells their arguments doom as a result of better data! There are two secular theories regarding Saturn’s rings, one is from the 1800’s by the man named, Édouard Albert Roche. 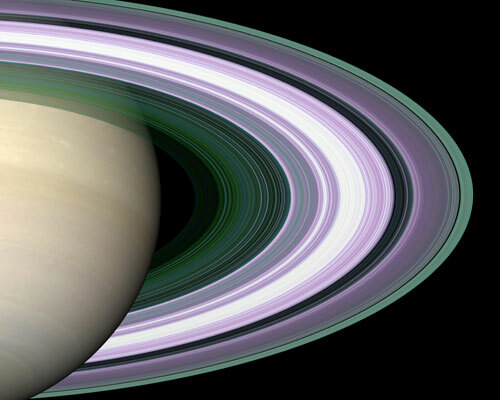 His proposal went like this, Saturn’s rings were once a moon which got ripped apart by tidal forces. The second theory goes like this, the rings were part of the original Nebular material from which Saturn was formed. What is the point? The point is, the consensus view among those who believe the solar system is billions of year old, also believe that Saturn rings are that old too, in their opinion. As you can see, some have a hard time with the rings being even 100 million years old which would be still too old for the creationist model. So it is believed that things like stars and planets formed very slowly, the rings are no exception, they would never accept even 25 million years old. It’s a math thing, given the dates recorded in the Bible, which tell us the Universe is young including Saturn’s rings. Observational data is very important, well beyond story telling proposals of old age which what would be argued for Saturn’s rings. The Cassini mission however, has brought new data which proves more conclusively that the rings are young not billions of years old! “The fascinating thing about the distribution of the heat flow is that it is not in keeping with the current preferred model of tidal heating of Io at relatively shallow depths,” said Ashley Davies. The mystery is trying to make something very old when it is actually quite young! Their objective is trying to find a way how this activity could have been going on for billions of years. It makes more sense with it being considered young because youthfulness reflects activity! The reason why it appears young is because it is young! 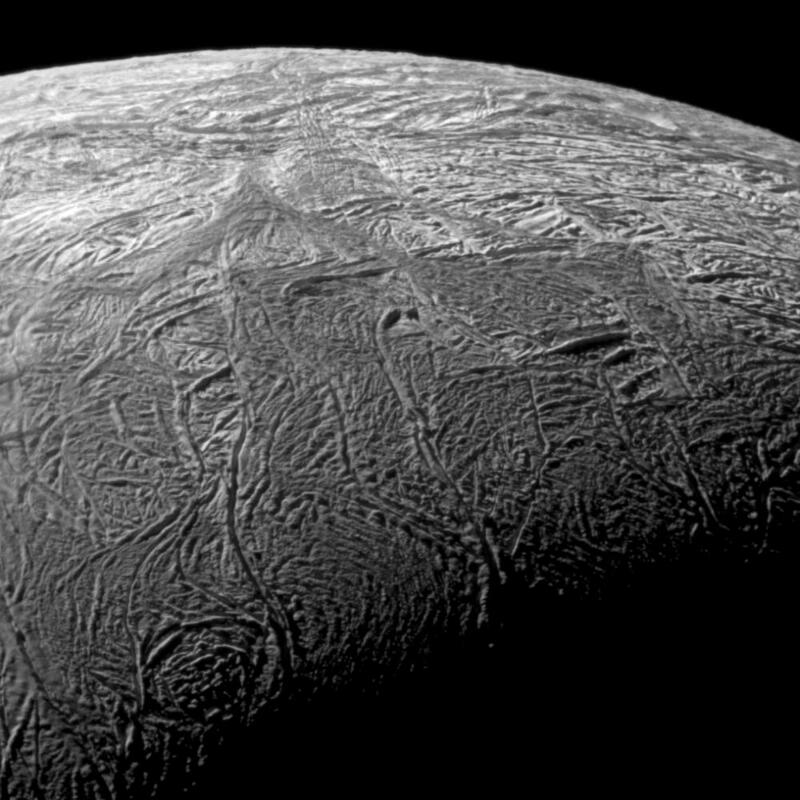 Enceladus is another moon where planetary scientists are working on a story that would suggest how the activity of this moon could last for billions of years. The geysers on Enceladus create plasma but it is unlike anything that has been seen before: tiny dust grains that pick up negative ions from water molecules pumped out the geysers. This plasma feeds a magnetic bubble, or magnetosphere, surrounding Saturn! Could this have been going on for billions of years? That is what planetary scientists are working on, trying to keep this activity that is common and more logical with youth, going for billions of years which is not logical. The assumption of old age concerning Titan and the predictions that proceeded from it, here are the facts, they were wrong about a global ocean; they were wrong about huge lakes of liquid ethane; they were enormously surprised to discover sand dunes on Titan but what about geology? They are still gathering data from this amazing moon, and once again it doesn’t look good for old age assumptions. Scientists hoped to find volcanoes but a new paper concludes that Titan gets its geology from the outside, instead from the inside. If this is found to be true then its implication consists of the surface features being created by wind, impacts and weather rather than active geology. The hopeful cryovolcano announced last year was challenged by Moore and Pappalardo, authors of the new paper. 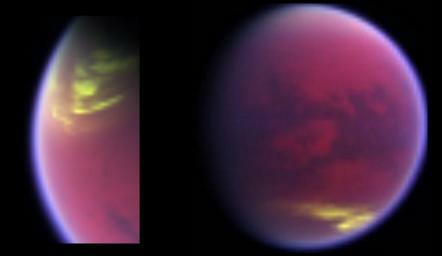 Could the evidence be pointing to a geologically dead world on Titan? Planetary scientists previously have had an age conundrum with Titan. They know that the methane in the atmosphere is destroyed and converted to other compounds in a one-way process. This puts limits on the age of the atmosphere which indicates a far less 4.5-billion-year age assumed for the solar system. This is why they hoped to find a reservoir of methane under the surface which would erupt in cryovolcanoes to replenish the atmosphere. In another paper from the same source, it analyzed Titan’s equatorial sand dunes. These dunes, covering about 12.5% of the surface, were a surprise when discovered, because scientists were expecting large lakes or even a global ocean. Scientists also doubted that the winds were strong enough at the surface to move particles around. Dunes also exist on Mars, Venus, and of course, Earth, but on Titan, the average 300-foot-high dunes are nearly1.9 miles apart, and getting farther apart at higher latitudes. Unlike the silica sands on Earth, the particles in Titan’s dunes are thought to be composed of hydrocarbon dust and ice precipitated out of the atmosphere. All together, they constitute the largest known reservoir of organics on Titan, because the combined area of dunes is about as large as the United States. The dunes infringe upon the theories of Titan’s age. Because for one, they are among Titan’s most youthful features; for another, they indicate a lack of persistent liquid on Titan’s equator, even though liquid ethane should have been raining onto the surface throughout Titan’s history! The presence of dunes implies that much of Titan is extremely dry. If spread out evenly over the globe, the particles in this largest reservoir of organics (larger than all the observed lakes combined) would fail to cover Titan with the predicted accumulation of hydrocarbons that must have been produced in the assumed 4.5-billion-year age of the moon.